↑ "New Wave of British Heavy Metal". Allmusic. สืบค้นเมื่อ 2009-04-11. ↑ "LosingToday reviews". LosingToday Magazine's review of BBC Live & In-Session. สืบค้นเมื่อ 2007-02-11. ↑ Erlewine, Stephen. "Motörhead Biography". Allmusic. สืบค้นเมื่อ 19 December 2008. 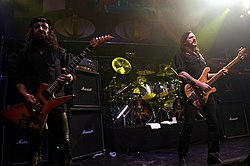 Motörhead wasn't punk rock... but they were the first metal band to harness that energy and, in the process, they created speed metal and thrash metal. ↑ "An Interview with Lemmy Kilmister". Classic Rock Revisited article. สืบค้นเมื่อ 2007-04-04.